Recipe and Photo by Steph in Thyme. Adapted for Intervale Food Hub ingredients! Pre-heat oven to 425 F. Place the peeled and trimmed carrots on a rimmed baking sheet. Toss with chimichurri so the carrots are completely coated. Arrange into a single layer on the baking sheet, then position on the oven’s middle rack. Roast the carrots for 25 minutes or until golden and can be pierced with a fork (but not soft, carrots should still have firmness to them al dente style). Don’t worry if you see that the minced chimichurri bits have turned dark during the roasting. While the carrots are roasting, prepare the pureé: Add the parsnips or potatoes (already cut into ½″ pieces) to a large pot. Cover with cold water and bring to a boil over medium-high heat. Cook until pieces are very tender and can easily be pierced through with a fork, about 10 minutes. Drain the parsnips and let cool for about 5 minutes. Add to a food processor or blender (you may need to work in batches) along with vegetable broth and butter. Process until very smooth, adding additional vegetable broth as needed (i.e. desire a thinner consistency). Scrape contents into a bowl and stir in the Parmesan and salt/pepper to taste. Cover and set aside until carrots are done. Remove carrots from the oven. Spread the purée into an even layer on the bottom of a serving dish. Pick up the carrots from the baking sheet with tongs or a fork so as not to bring over excess liquid. Wipe off any dark bits of unwanted minced chimichurri. Arrange the carrots in a single layer on top of the purée. Garnish the carrots with extra chimichurri, drizzling evenly across the carrots. This is a great combination for a quick, flavorful dinner! Chimichurri sauce is like a burst of summer color and flavor. Recipe Adapted from Eating Well. Eating Well photo. Preheat oven to 425°F. Line a rimmed baking sheet with foil or parchment paper and spray with cooking spray. To prepare salmon: Place salmon skin-side down on the prepared baking sheet. Rub with oil and sprinkle with salt and pepper. Roast until it flakes easily with a fork in the thickest part, 8 to 10 minutes per inch of thickness. To serve, slide a thin spatula under each piece of fish, separating it from the skin, and place on a plate. Serve with about 2 tablespoons sauce each. Serve with mashed potatoes, as shown here, or with roasted root vegetables! Make the pancakes: Toss cabbage, carrot, kale, scallions and salt together in a large bowl. Toss mixture with flour so it coats all of the vegetables. Stir in the eggs. Heat a large heavy skillet on medium-high heat. Coat the bottom with oil and heat that too. To make a large pancake, add 1/4 of the vegetable mixture to the skillet, pressing it out into a 1/2- to 3/4-inch pancake. Gently press the pancake down flat. Cook until the edges beging to brown, about 3 minutes. 30 seconds to 1 minute later, flip the pancake with a large spatula. (If this is terrifying, you can first slide the pancake onto a plate, and, using potholders, reverse it back into the hot skillet.) Cook on the other side until the edges brown, and then again up to a minute more (you can peek to make sure the color is right underneath). To make small pancakes, you can use tongs but I seriously find using my fingers and grabbing little piles, letting a little batter drip back into the bowl, and depositing them in piles on the skillet easier, to form 3 to 4 pancakes. Press down gently with a spatula to they flatten slightly, but no need to spread them much. Cook for 3 minutes, or until the edges brown. Flip the pancakes and cook them again until brown underneath. If desired, make okonomiyaki sauce: Combine all sauce ingredients in a small saucepan and let simmer for 3 to 5 minutes, until smooth and thick. Serve pancakes with sauce and any of the other fixings listed above, from Japanese mayo to scallions and toasted sesame seeds. Do ahead: Extra pancakes will keep in the fridge for a couple days, or can be spread on a tray in the freezer until frozen, then combined in a freezer bag to be stored until needed. Reheat on a baking sheet in a hot oven until crisp again. Preheat oven to 400 degrees F and arrange sweet potatoes and onions on a bare baking sheet. Drizzle both with a bit of oil, making sure the flesh of the sweet potatoes are well coated and placed skin side down on the sheet. Bake for 10 minutes, then remove from oven flip sweet potatoes. Once hot, add 1 Tbsp oil and chickpeas and sauté, stirring frequently. If they’re browning too quickly, turn down heat. If there isn’t much browning going on, increase heat. I found 10 minutes total at slightly over medium heat was perfect. 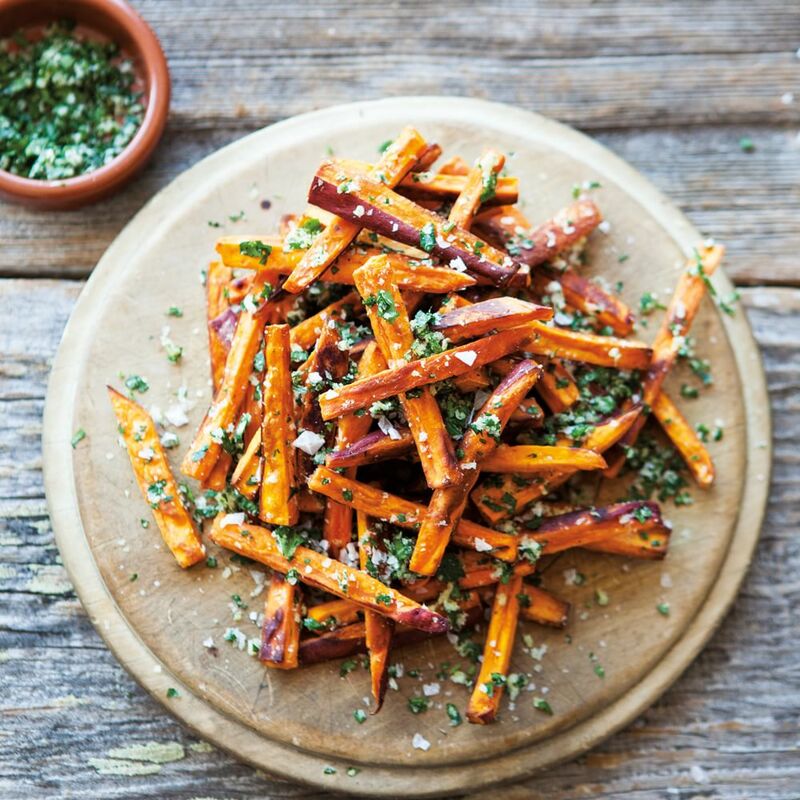 To serve: Slice sweet potatoes into bite size pieces. Divide vegetables between 3 serving bowls and top with chickpeas + tahini sauce. Cut carrots in two-inch lengths. Combine ground cumin and coriander with olive oil to make a spice rub; toss carrots to coat them. Season well with salt and pepper. Spread out the carrots in a single layer on a baking sheet; cover tightly with foil. Roast carrots at 425°F for about 15 minutes. Uncover and continue to cook, stirring once or twice until browned and tender, about 30 minutes more. Blanch carrots until crisp-tender. Meanwhile, heat an oven and baking sheet to 450°F. Toss carrots with melted brown butter and spread them out on the hot baking sheet. Roast the carrots until caramelized and tender. Toss with toasted hazelnuts (or walnuts or almonds), and finish with a sprinkle of thyme and/or parsley. A splash of balsamic vinegar or a drizzle of reduced balsamic vinegar helps to balance carrots' sweetness. Toss carrots in balsamic vinegar just before the last 10 minutes of roasting or just after they finish. Alternatively, serve roasted carrots with a drizzle of syrupy reduced balsamic vinegar. Whisk together orange juice, orange zest, minced ginger (some minced garlic, too, if you wish), and olive oil. Season with salt and pepper. Toss the carrots in the marinade (reserve about 1/4 cup, to toss with the carrots after cooking). Spread the carrots out on a parchment-lined baking sheet. Cover tightly with foil and roast at 425°F for about 15 minutes. Uncover and continue to cook, stirring once or twice until browned and tender, about 30 minutes more. Roast carrots until caramelized and tender, then toss warm carrots with a spoonful of tahini and a sprinkle of flaked sea salt and black sesame seeds. Finish with chopped cilantro, parsley, thyme, or oregano. Finish any roasted carrots with a sprinkle of goat cheese or feta, a dollop of ricotta, or a spoonful of Greek yogurt combined with a shaving of raw garlic or a slash of lemon juice. Finish any roasted carrots with a sprinkle of toasted nuts or seeds for crunch and a nutty taste. Roast carrots in two-inch lengths or roast small carrots whole. Pulverize garlic, ground cumin, fresh herbs of your choice, and lemon or orange zest in a food processor or mortar and pestle. Blend in olive oil, salt, and pepper (and red pepper flakes if you wish). Toss and rub the carrots in the paste-like mixture and roast until tender and browned. Toss the hot, cooked carrots in a splash of lemon juice or orange juice, or red wine or balsamic vinegar. Serve with sliced avocado and a sprinkle of flaked sea salt over the top, and if you wish, a handful of greens or a spoonful of cheese or yogurt (see #7). Poke each sweet potato with fork tines several times on the top. Bake directly on oven rack or on a baking sheet for 45 minutes. In a medium bowl, toss the chopped kale in olive oil, salt, and pepper. Bake in 400 degree oven for about 10 to 12 minutes, or until crispy, turning chips halfway through and rotating pan for even cooking. May have to make in two batches or use two baking sheets to fit all of the kale. To assemble: Make a slit in the top of each of the baked sweet potatoes. Stuff each with crispy kale, and top with cheese and walnut pieces.